After a seven year journey attached to the side of Cassini, Huygens was released towards Titan on 25 December 2004. The probe coasted for 20 days before atmosphere interface at Titan on 14 January 2005. As the probe descended through the atmosphere the Cassini probe passed by Titan at a distance of 60 000 kilometres. The second Titan flyby on 13 December 2004, placed the Cassini-Huygens spacecraft on a trajectory that, uncorrected, would lead to a subsequent flyby at an altitude of about 4600 km. A targeting manoeuvre was required, therefore, to achieve the desired interface conditions for the Huygens prboe. The probe targeting manoeuvre was executed on 17 December 2004 and placed Cassini-Huygens on a direct impact trajectory with Titan. Such a manoeuvre was necessary as once released there was no way of changing Huygens' trajectory. Final commands were sent to Huygens on 21 December 2004 including the setting of the Mission Timer Unit (MTU). The MTU activated about 5 hours before the Huygens reached the interface altitude of 1270 km above Titan's surface. On 25 December 2004 at 02:00 UTC the Spin/Eject Device (SED) separated Huygens from Cassini with a relative speed of approximately 0.35 ms-1 and a spin rate of 7.5 rpm. The orbiter targeting is such that the velocity increment provided by the SED springs provides the final targeting to the entry aimpoint. The spin-stabilized Probe was targeted for a southern-latitude landing site on the dayside of Titan. In order to meet the probe dynamic entry conditions, minimize trajectory dispersion and thus enhance data relay link performance, the probe entry angle into the atmosphere was set at a relatively steep at -65° + 3° (99% certainty). This entry angle would also give the Huygens probe the best opportunity to reach the surface. The Orbiter's Reaction Control System (RCS) was used to control the combined spacecraft attitude immediately prior to the separation event. RCS control algorithms maintain the spacecraft attitude and rate about all three spacecraft axes. Following the turn to the probe separation orientation, sufficient time was allowed for the spacecraft to attain a quiescent state with rates below 0.01 degrees per second on all axes. Once the separation command is initiated, a sequence of dynamic events took place that results in separation of the Probe. These events included the firing of pyro bolts, engagement of the separation push-off springs, ramps and rollers and the separation of the electrical connectors, as well as motion of Cassini under the separation induced loads. All of the activity between the time of the separation command and the time at which the Cassini and Huygens were no longer in physical contact took place in approximately 0.15 seconds. The Huygens separation is a strenuous event for Cassini, and attitude control must be configured accordingly. The Orbiter's Attitude Control Subystem (AACS) switched to coast mode 10 seconds before probe separation. [In coast mode the RCS thrusters are inhibited from firing.] The RCS thrusters were re-enabled around 60 seconds after Huygens separation. There was no communication between the spacecraft and the Earth while Cassini-Huygens conducted the probe release, with all telemetry recorded for later playback. The last two manoeuvres for Cassini before Huygens entry, the Orbiter Deflection Manoeuvre (ODM) and cleanup, set Cassini on a trajectory allowing targeting at atmosphere interface point and achieve the radio relay link geometry. The ODM was executed on 28 December. The manoeuvre, at about 24 ms-1, corrected the Cassini trajectory to flyby Titan at an altitude of 60 000 km and delayed the closest approach to until around two hours after Huygens reached the entry interface. The relative position of Cassini, Huygens and Titan enabled a theoretical maximum coverage of 4 hours 30 minutes. 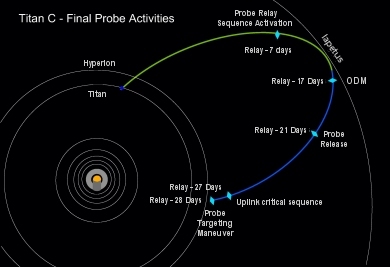 Cassini's background sequence S07 began on 16 December, and contained the bulk of the critical probe activities, including release and descent of Huygens. Because of the numerous sequencing activities, the background sequence was divided into three sections (A, B, and C). On 16 December the Solid State Recorders (SSRs) were set to the configuration used to record data during probe descent. The first two telemetry partitions (#4 and 5) were each sized with enough capacity for the probe mission plus a 15% buffer. The third telemetry partition (#6) continued to store real-time engineering data as usual. The probe relay critical sequence, for communications between the Huygens Probe and Cassini Orbiter during the approach to Titan and descent in the atmosphere, was uplinked separately from the background sequence S07 on 18 and 19 December. 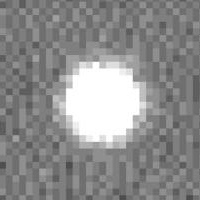 One week after Huygens release, Cassini made a flyby of Iapetus at an altitude of 117 500 km. Iapetus orbits Saturn at a distance of over 3.5 million km and this was the only opportunity before a close-up view in 2007. Note: Ground UTC is the time that the signal is received on Earth. The light travel time from the spacecraft to Earth is about 1 hour and 7 minutes. Note: times represent scheduled mission time rather than actual time the event took place.